Sir John Charnley when pioneering hip replacement in the late 1950s and early 1960s did initially try a resurfacing procedure. He used materials (Teflon) to recap or resurface the ball joint and also to re-line the socket. However, these failed fairly early on in a matter of a year or two because the material shredded debris which caused bone resorption. This led Sir John to consider different materials and more robust methods of fixation. For that reason Charnley used acrylic bone cement to fix components more securely to bone (the reason for the stem or shaft of the component going down the internal part of the bone) and also used different materials of metal on plastic. However, other surgeons subsequently reconsidered resurfacing using perhaps better materials in terms of material, design and fixation and various pioneers such as Freeman from the London Hospital, Amstutz from Los Angeles and more recently McMinn from Birmingham have reconsidered and reintroduced resurfacing. 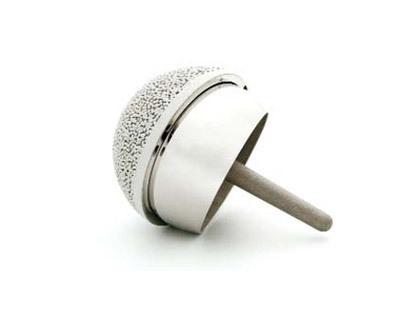 The Birmingham hip resurfacing introduced by McMinn from 1996 onwards has led to a rekindled interest in hip resurfacing. 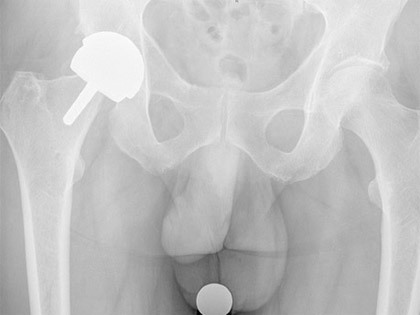 McMinn started experimenting with different methods of fixation from 1991 but by 1996 had settled on an uncemented porocoated acetabular component articulating with a metal femoral component cemented onto the femoral head. This bearing is a metal on metal cobalt chrome articulation which has extremely low wear properties compared to the conventional metal on plastic although the wear debris material is a lot smaller. Less invasive - involves taking less bone off the femur. Should it be necessary to revise a resurfacing more bone is available and therefore potentially easier to revise. However, there are also potential disadvantages. May take slightly more bone off the acetabular side of the hip joint (this is a factor disputed in some scientific papers). A risk that the femoral neck may fracture (a fact substantiated in the literature - incidence of 0.5 to 1.5%). Effects of the release of material from the metal bearing - mainly cobalt and chromium metal ions. Function may not be good as a standard hip replacement because of the potential of the femoral neck abutting or impinging on the rim of the acetabulum, particularly in flexion. As yet we have limited information on the medium to long term outcomes of resurfacing versus total hip replacement. The short term results from large epidemiological studies - joint registries particularly from Australia - would indicate a higher failure rate within the first three years of resurfacing compared to patients undergoing hip replacement. It remains to be seen what the comparable outcomes will be at 10 years and 20 years which are the longer benchmark figures for joint replacement surgery. Other unknowns about hip resurfacing - the incidence of late collapse of the femoral head, the fate of neck thinning (see x-ray) and potential local reaction to metal - ALVAL (aseptic lymphocytic vascular and associated lesions). ALVAL is not yet fully understood but tends to present as pain and occasional swelling around the hip. X-rays are often normal but the swelling can sometimes be seen using a special form of MRI scanning (MARS- Metal Artifact Reduction Scan). The proportion of patients developing this problem is, as yet unknown but latest reports (March 2010) suggests a incidence of between 1% and 6% depending on age and gender. The extent of the metal reaction can vary from a minor reaction to fluid collections to more extensive tissue swellings (pseudotumours) We have had some experience at dealing with this problem and it appears that revision of the components to a non metal-on-metal articulation appears to treat the pain satisfactorily, particularly if treated early. Research in this field is continuing . It is not clear at present whether this condition is a hypersensitivity type reaction (type of allergy) or a normal reaction to an abnormal load of metal ions.,although it is likely that high wear/ high local metal ion levels are the predominant contributing factor. There are some concerns regarding the longer term effects of very small cobalt and chromium accumulation in the rest of the body. The cobalt and chromium is dissipated in the blood stream in the lymphatics and very small traces can be found in distal organs, namely the spleen, liver and even the brain and although the concentrations are quite small we do not yet fully know the long term consequences of it. There are some studies that suggest there may be some chromosomal changes in patients who are exposed to metal ions. The question of late oncological or cancer risks have been looked at and as yet looking at cancer registries, particularly from Scandinavian countries, there is no evidence that there is an increased cancer risk in patients exposed to metal on metal articulations but authorities debate whether the scientific data is completely robust at this stage. Other potential risks include that of teratogenesis, ie birth defects in children. It is known that small amounts of metal can be transferred across the placenta from the mother to the child. As yet there are no known cases of teratogenic effects but again, this has been questioned by some authorities and as such some surgeons do not recommend resurfacing in females who may wish to consider having a family.